So you’ve been sucked into the hype behind making videos for your business on social media. Great! Now do you know your content strategy for video? It can be challenging to think through this. But making a video just to make a video is like moving a pen just to make scribbles on paper. Video is a means of communication. And like all means, it can be empty. The key is: Your videos have to be interesting/useful. And the first step in being interesting or useful is to be generous and give away value. The one question that must rule your video content creation is, "What value is this adding to my audience?" Will they find this interesting, or am I just making noise? This consideration needs to be taken seriously. This article found that 41% of people will unfollow a brand on social media that doesn’t share relevant information. That's how to capture people's interest. Sometimes, you do. And of course, I'm a fan of that. But the truth is, you can create a lot of these videos on your own. These days, iPhones are capable of shooting shareable video if used properly. Or if you want higher quality equipment, you can see some recommendations here. The most important thing for social video is creating authentic, useful content. So I compiled this list of ideas to help get your wheels turning on what content should go in yours. 1. Educate on things related to your industry. This is a big one. You can create a TON of content like this. If people follow you on social media, it's because they're interested in what you do. So if you educate them on something in their area of interest, you'll captivate their attention. // Health and fitness tips. Which workouts are best for specific goals? What diet is best for certain body types? // A series on various approaches to working out (like cardio vs. strength training). // An online workout glossary. Make a short video for each work out. Show how it's done properly. You could make like 200 of these! // Explain what investing is in the first place. // Create a series of video tips for simple ways to save money long term. // Create a series explaining key concepts. // Create a series covering investment options. // Share tips for hosting parties. // Interior design how-to videos. // Name and differentiate between styles of design. // Showcase your new products. // Make a fun series on table etiquette. // One video per week highlighting a dish until you've covered the whole menu. // General tips for the wedding day. Tips for catering, decorations, scheduling. // Tips for wedding day photos. When to do them, how to look your best. // Teach other photographers how to do their job better. // Guides for how to dress on specific occasions (e.g. the difference between black tie and black tie optional). // How to do simple fixes, like a leaky faucet or jammed door. // Best practices for taking care of your plumbing. // How to cut electricity costs. Remember, you want to give away value. If people see you do this, they'll think you really want to help them and not just take their money. 2. Explain your products in general. What do your products do? How many varieties do you have? What makes them different from one another? What are the color options? How much do they cost? This works best if you new products often, like a retail store. It's a built-in way to consistently have an opportunity to make new content. But don’t be spammy, you know? People like knowing when they're able to save a few bucks for something they want. But they don't like knowing it 4 times per day. 5. Talk about the product creation process. 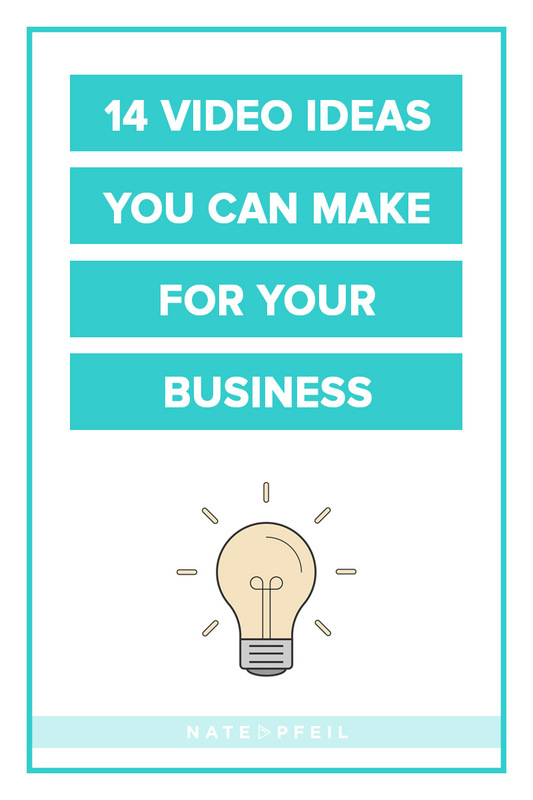 This one can be interesting across a huge variety of businesses, especially hand-crafted businesses. Etsy shop owners, candy makers, painters. But even industrial companies and general contractors. I mean, those programs that show how houses are built have been on PBS longer than I've been alive for a reason. 6. Show behind the scenes. What goes on in your warehouse when filling an order? How do you make your wedding cakes? How do you make your bouquets? Anything that can give the public a view of something they rarely get to see. 7. Show all the uses of your product. Your product comes alive when people see clearly what is actually does. Show it being used. Amazon Echo and Google Voice are employing this tactic like crazy right now in their ad campaigns. Also, depending on your product, maybe there's a secondary use for it people haven't considered. What do you do in general? Who do you help? Do you have offers at different prices? Explain the differences. 9. Talk about your process. The whole thing from start to finish. This could be immensely helpful for your customers. You could easily make a whole series out of this idea. If you make products, show how the product is made from start to finish. What's the first step after the client contacts you? What are the key terms or information they need to know? What questions do you go over in the beginning? When does the core of the work happen? At which point is a project marked completed? This is one of the best uses of video. Tried and true. Few things persuade your potential customers like other customers talking about how great you are. This idea is so huge for nonprofits. So many times they spend time talking about stats and data and neglect to tell the stories of the people they serve. What if you spent 80% of your time telling stories to move the heart and 20% reviewing facts? This would make a great glimpse into your company's culture, which is good for social media. Your followers want authenticity. These videos could also be used as a recruiting tool for future hires. What are your holiday hours? Any new menu items? New products in your store? Offering a new service? Opening up a new branch? Have a new system in place that the customers use? Launching a new website? 13. Interview with an industry expert. 14. Tell the story of how you started. The backstory can be super interesting. I mean, what made you so passionate about making your own soap, or grooming dogs? This is a good opportunity to establish an emotional connection with your audience, especially if your story is remarkable. 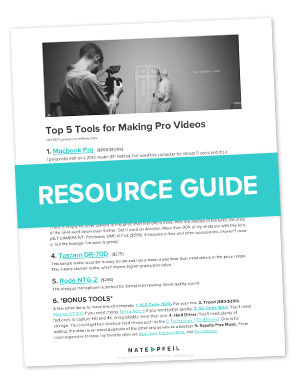 Hopefully this helps get the ball rolling on what you could do with video for your business. Remember, you don't have to be amazingly innovative. You just have to be helpful or interesting.